Finally, the Holy Bible in its Original Order! With all due respect to the translation itself, the books of the KJV are quiteout of order! The fact is, King James and his team of 54 translators missed a golden opportunity to produce a complete Bible in which the books follow the original canonical order. And it’s not like they didn’t know; the inspiredmanuscript order was widely know among scholars. Why was the order ignored? Political expediency? A fear of offending the “doctrinal sensitivities” of the Church of England? We can only speculate. But now, 400 years later, a newBible is making headlines—The Holy Bible In Its Original Order. This extraordinary Bible is unique in two ways. 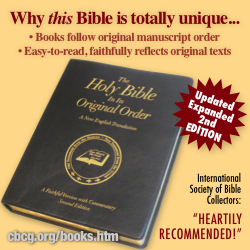 Once the original order of the 49 biblical books has been restored, God’s purposeful design of the Scriptures begins to unfold, revealing its divine inspiration. Significant portions of Scripture become “unscrambled,” unlocking vital keys to understanding. From an arrangement of neglect and disorder, the Bible suddenly takes on a new sense of balance, symmetry and unity. Secondly, this version is a new easy-to-read translation, one that reflects the meaning of the original Hebrew and Greek with fidelity and accuracy. Combining current scholarship with the latest in archeological findings—yet, free from the influence of religious tradition and presupposition—The Holy Bible In Its Original Order presents the timeless message of the Holy Scriptures with unparalleled clarity. Included are Commentaries providing accurate accounts of the writing, canonization and preservation of the Bible. Various Appendices answer questions such as: When was Jesus born? How did Christ fulfill the Law and the Prophets? When was Jesus crucified? When was He resurrected? What does it mean to be “born again”? What are “works of law”? What are the true teachings of the New Testament Church Jesus founded? Also, biblical and historical Chronologies show an accurate timeline from creation to the present; detailed Footnotes explain hard-to-understand Scriptures. Includes center column references; word definitions and alternate renderings for key words; beautiful original artwork of the Temple in Jesus’ time; 282 pages of commentary; and various maps. New in this 2nd Edition “Understanding Paul’s Difficult Scriptures”—a vital reference tool for serious students of the Bible! With 1432 pages, The Holy Bible In Its Original Order is only 1-1/2 inches thick—and measures 8-1/4 by 10-1/2 inches. Features: genuine handcrafted lambskin cover with gold stamped lettering; premium paper with gold gilded edges; wide margins for note-taking; triple bound for extra long life. Please visit cbcg.org/books.htm for ordering information.